Swinging on a swing is a classic park and recess activity that continues to be enjoyed by adults, children and toddlers. Designed with durability and accessibility in mind, the 8' Double Bay Swing set features 2 comfortable strap seats, 2 infant seats which allows the opportunity for everyone to swing together. All four seats allow two-way entrance, to best suit ones comfort and enjoyment. Both swing strap seats and infant seats securely attach with 'S' hooks, clevises and welded chains to the top frame rail. The highly durable bipod swing frame constructed with 2-3/8" galvanized iron piping and features blue or green powder-coated 2-7/8" iron pipe yoke fittings, that helps reinforce the structure while adding a burst of color. 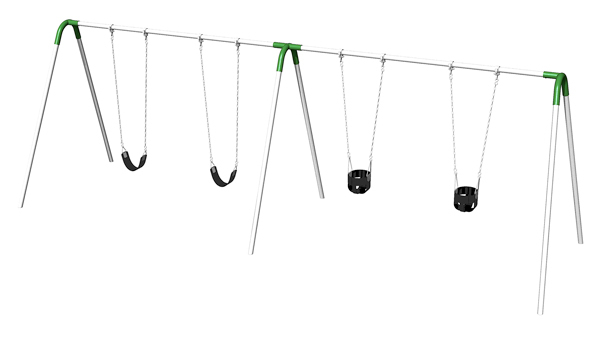 Combine fun, socialization and exercise with the Double Bay Swing Set.